Our Screen/Storm Door sale is coming to an end. Order our solid wood Screen/Storm Doors by October 31st to save 15%. Nothing compares to gentle breezes wafting through your home... and savings on air conditioning bills are assured. For Fall and Winter, optional Storm Panels convert Screen Doors into great looking Storm Doors, with extra comfort for you and your family! 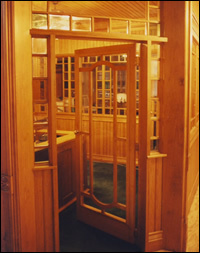 But there is a third way to use a Vintage door... Order your Door with only our optional tempered safety glass storm panels and use it as a unique Interior Glass Door! Hanging such Doors inside your home or business creates the special elegance only a glass Door can bestow, as they admit light between rooms with a grace and charm that’s difficult to achieve any other way. There's a subtle refinement to any room fortunate enough to have glass Doors, and your good taste will be recognized by all who visit! So, whether you need Doors at your front porch, back entry, or inside, we have a design for you and a great discount through October 31st. Turns out, Dad had been reading his daughter-in-law’s cooking blog where she introduced us to the French cooking term, “mise en place” (pronounced [meez on plas], literally "putting in place"). 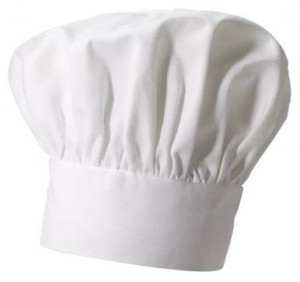 This phrase is defined by the Culinary Institute of America as "everything in place", as in set up. It is used in professional kitchens to refer to organizing the ingredients and tools that a cook will need to prepare the meals they are creating that shift. 1) "Like" us on Facebook! After you do, please send us a Facebook message, and we'll reply with a Coupon Code for $10 off your next order. 2) Overstock Sale - Items on sale are listed on applicable item pages for savings up to 50% off! 3) Yellow Pine Beadboard and V-Groove Board is 20% off! Use Coupon Code YP20 at Checkout. 68% of the folks at Vintage Woodworks have been with the company 10 years or more. And, our overall average is 15 years! 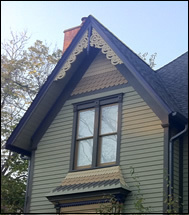 Our Old Lace Gable Decoration looks right at home here! We just love how they combined not only different patterns but also different colors of our Fancy Cut Cedar Shingles. Ah ha… now we know how those TV chefs make it look so easy! They have their “meez” in place! As explained by Anthony Bourdain, “One’s meez is an obsession, one’s sword and shield, the only thing standing between you and chaos. If you have your meez right, it means you have your head together, you are “set up”, stocked, organized, ready with everything you need and are likely to need for the tasks at hand.” Got all that? In other words, spend some time beforehand and get all your ingredients out, measured and ready to use." While the term “meez” was new to us, the concept was not. We’ve always tried to make sure our customers were equipped to tackle their projects with the proper components and organized information. So, as you hustle to finish your projects before the cold north wind sends you inside to focus on the holidays, here are a few of our favorite tools to help get your “meez” together! Spinners and Brush Stand - Using a simple "spinning" technique, this tool makes painting rings on turned items (or even the entire length of Balusters) much easier. Crown Moulding Templates & Book - 132 full color pages contain all the information needed to cut and install Crown Moulding and Trim. Set of 8 templates helps you cut perfect miter cuts. Tell us... what other tools would you find helpful?